Its curvaceous good looks – equally good in roadster and fixed-head forms -were clearly related to the Le Mans-winning D-types of the 1950s, sculpted by aerodynamicist Malcolm Sayer. Its structure was similar too, with a monocoque central tub and a tubular front section carrying the engine and front wheels -though the exotic aluminium and magnesium alloys of the D-type were replaced by steel. The E-type’s engine was also shared with previous models, a 3.8-litre development of the fine straight-six XK unit with a claimed 265bhp. Wishbones and torsion bars provided independent suspension at the front, and the rear was also independently suspended by lower wishbones, fixed-length driveshafts and twin coil spring/damper units. A better gearbox and a torquier, 4.2-litre engine were introduced in 1964, and a two-plus-two coupe” followed in 1966. Nine inches longer than the two-seater and an inch and a half taller, the two-plus-two was oddly proportioned – giving it an ungainly appearance. 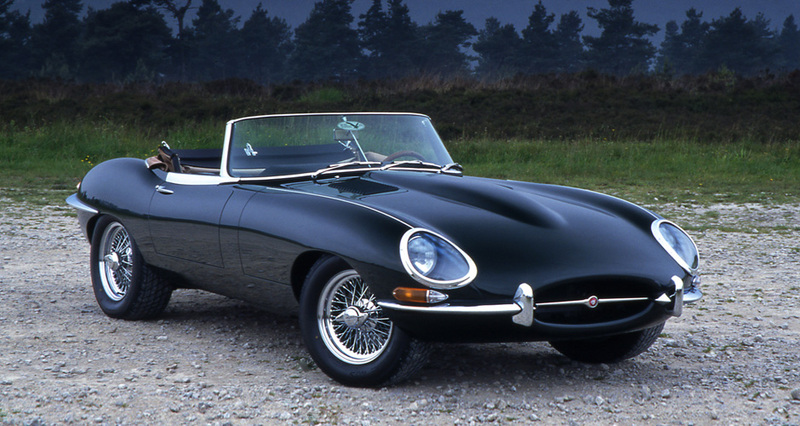 By the end of the 1960s increasingly stringent emissions rules in the US meant that a ‘Federal’ E-type produced just 177bhp. More power was a priority, and it came from a brand new V12 engine designed by Walter Hassan and Harry Mundy. In American specification the V12 offered a genuine 250bhp, despite lacking the fuel injection system originally planned – instead it was fuelled by a quartet of Zenith Stromberg carbs, and sparked by Lucas Opus electronic ignition. The V12 Series III E-type of 1971 used the longer wheelbase of the old two-plus-two car, with flared wheel arches, wider wheels and a new flush grille.